Using the dynamic data capability, you can connect SharePoint Framework client-side web parts and extensions to each other and exchange information between the components. This allows you to build rich experiences and compelling end-user solutions. Dynamic data in the SharePoint Framework is based on the source-notification model. Component designated as a dynamic data source, provides data and notifies about its changes. Other components on the page can subscribe to notifications issued by a dynamic data source. When handling notifications, dynamic data consumers can retrieve the current value of the dynamic data set exposed by the data source. Every dynamic data source implements the IDynamicDataCallables interface. 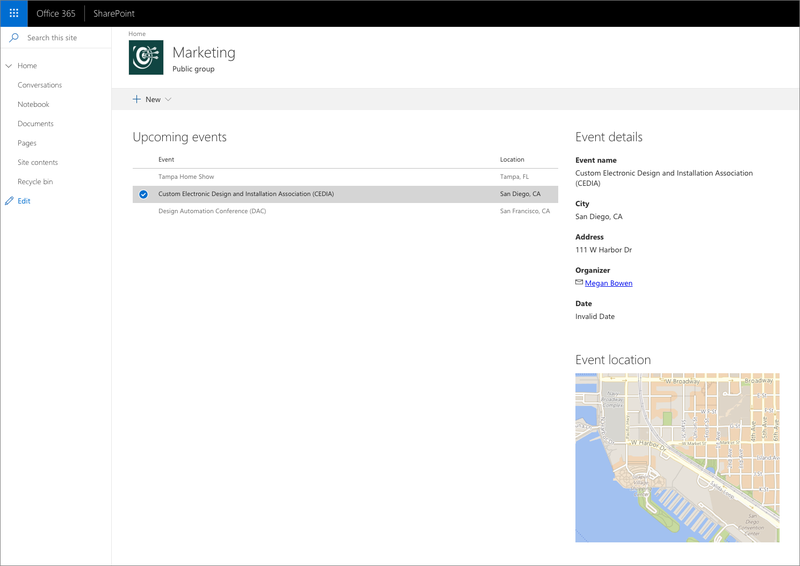 Following, is an example of a web part that displays a list of upcoming events. For each event, it includes some information such as its name, description and location. 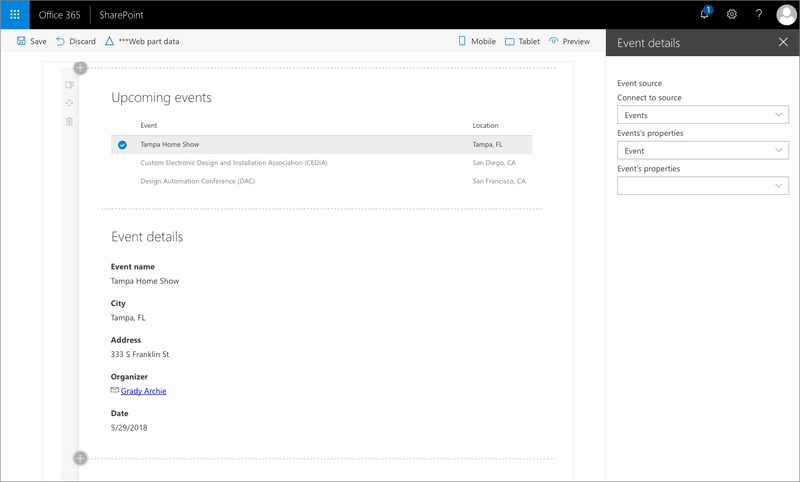 The events web part exposes information about the selected event to other components on the page in two ways: the complete event information and the location address. The IDynamicDataCallables interface can be implemented by any class, not just web parts and extensions. If the dynamic data source requires complex logic, you should consider moving it into a separate class rather than implementing it directly inside a web part or extension. The class implementing the IDynamicDataCallables interface must define two methods: getPropertyDefinitions and getPropertyValue. The getPropertyDefinitions method returns an array of types of data that the particular dynamic data source returns. In the previous example, the web part exposes detailed information about an event and its location. Even though the information comes from a single object (_selectedEvent), by exposing it in two different shapes, the web part is more reusable and could be used in combination with other web parts that aren't specific to events, such as a map web part that can show a map for the specified address. The list of the data types exposed by the data source is displayed to end-users when connecting web parts to the data source. The getPropertyValue method returns the value for the particular type of data. The value of the propertyId argument corresponds to the id of the definition specified in the getPropertyDefinitions method. To register a component as a dynamic data source, call the this.context.dynamicDataSourceManager.initializeSource() method, passing the instance of the dynamic data source as a parameter. In the previous example, the web part itself implements the IDynamicDataCallables interface, which is why the initializeSource method is called with this as its argument. In the example code, the web part displays upcoming events in a list. Each time, the user selects an event from the list, the web part calls the _eventSelected method. In that method, the web part assigns the selected event to the _selectedEvent class variable and issues a notification that the information about the selected event and location has changed by calling the this.context.dynamicDataSourceManager.notifyPropertyChanged() method passing the id of the definition that represents the changed data set. Web parts can consume data exposed by dynamic data sources present on the page. Following is the code of a web part showing on a map the location of the event selected in the events list web part showed previously. SharePoint Framework offers standard UI for connecting web parts to dynamic data sources. This UI simplifies working with dynamic data by discovering available dynamic data sources and their properties and persisting the configured connection. To use this UI, a web part that consumes dynamic data must include a few specific building blocks. In this example, the address is a string, but other types of data such as boolean, numbers or objects are supported as well. Web part properties defined as DynamicProperty can retrieve their data from dynamic data sources or values provided directly in the web part properties. Because the same web part property can be used for both dynamic data sources and static values configured in web part properties, you don't need to define multiple web part properties what simplifies building versatile web parts. Possible values for the dynamicPropertyType property are: boolean, number, string, array and object. 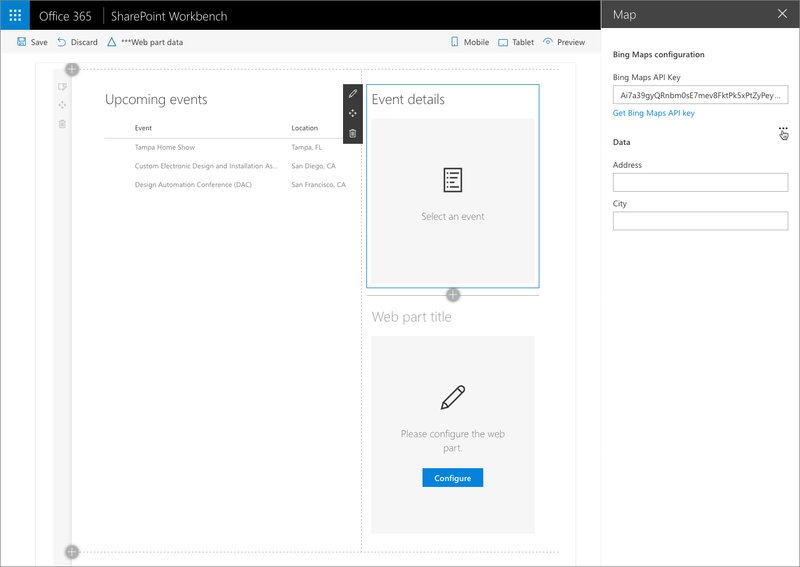 To allow users to connect web parts to dynamic data sources available on the page, SharePoint Framework provides a standard UI which can be accessed from the web part property pane. When using the standard UI to connect a web part to a dynamic data source, ensure, that the dynamic data source returns a value for the given dynamic property (in the previous example, there is an event selected in the list of events). If it doesn't, the UI will not be able to determine the type of data returned by the data source and setting up the connection will fail. For each set of dynamic properties, add a new group using the PropertyPaneDynamicFieldSet method. For each dynamic web part property, add a PropertyPaneDynamicField, which will allow users to select from which property, the web part property specified in the PropertyPaneDynamicField should retrieve its data. In this example, all dynamic properties share the selected connection and property. This is useful in cases, where the selected property exposed by the data source is an object and you want to connect your dynamic properties to the different properties of the selected object. If you want to use the same data source, but connect each web part property to a different property exposed by the selected data source, you can use DynamicDataSharedDepth.Source instead. Finally, if you want each property to retrieve its data from a different data source, you can set the sharedConfiguration.depth property to DynamicDataSharedDepth.None. When building web parts, you can allow users to connect web parts to other components on the page, or specify values of web part properties themselves. This requires very little additional effort and allows you to build web parts that are more versatile and suitable for a broader range of use cases. To allow users to be able to choose if they want to load data from a dynamic property or enter the value themselves in the web part properties, you can define the web part properties group as a IPropertyPaneConditionalGroup group. A conditional web part property pane group consists of a primary and a secondary group. Using the showSecondaryGroup property, you can specify when the secondary group should be visible and the primary group should be hidden. In the example above, the secondary group, which is used for connecting the web part to a dynamic data source, will be visible when the user selected to connect the web part to a dynamic data source by clicking the ellipsis (...).